I was initially pleased at having settled at $17 for a stainless steel Rolex Explorer II. Buyer’s remorse, valid or not, inevitably follows such transactions, but given the types of prices pitched to Americans, who are widely presumed to have vastly more money than street wisdom, I felt good about the deal. 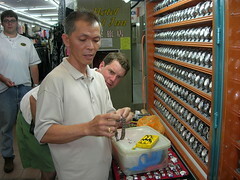 Fellow travelers experienced in such things agreed the watch was in relatively good shape for a fake and I took some strange comfort in seeing the salesman’s prodigious array of tools next to his wares. Compared to the other hucksters in the market, my salesman was a veteran, blessed with a kind face, a rare patience with the process and a genuine sense of pride about the quality of his fakes. Originally uploaded by Tommy Perkins.